Happy Monday! Today's manicure comes from Deborah Lippmann's 2014 Spring Collection which is chock full of the type of pretty pastels that make me absolutely giddy. I can be such a girly girl sometimes but I've always been a huge fan of minty green, lavender, periwinkle, and of course ballet pink. La Vie En Rose is an absolutely lovely semi-sheer baby pink and with Valentine's Day just around the corner I thought it would be perfect to share. Truth be told, there was actually a point in my early youth that I dreamt of becoming a professional ballerina. That dream quickly faded after age 5 when my sister decided dance class was stupid and so I piggy-back quit but that doesn't stop me from occasionally pretending my dream came true via innocent nails and wide-necked wraparound sweaters. I don't normally like semi-sheer polishes but this one makes my hands look so pretty I can't help but love it. Here I applied a base of OPI Nail Envy with 4 coats of La Vie En Rose (3 would be perfect for a more natural semi-sheer look) and topped with Seche Vite. Unlike my last sheer polish experience I wasn't as angry at adding an additional layer for this one. The difference is that this polish was much more self-leveling and the layers went on smoothly. 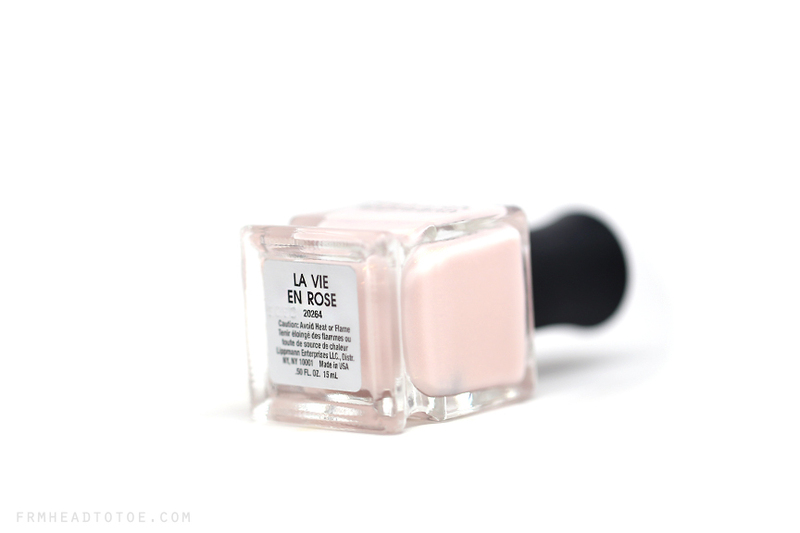 I will honestly say it may be that my Zoya Gaia had become old but La Vie En Rose fresh was pretty easy to apply in general. As solid creme polishes are my favorite, I'm really looking forward to the rest of the Deborah Lippmann Spring collection polishes which appear to be more opaque than La Vie En Rose. It makes me itchy for spring to actually be here! Bring on the pastels! Readers, how do you feel about semi-sheer polish? What is your favorite pastel polish color? Let me know in the comments! I love the name of the color (rose obsessed!) and the light pink color is so soft and perfectly girly! Such a lovely, feminine colour! Looking forward to Spring! For your Zoya Gaia polish, have you tried nail polish thinner? My creme nail polishes tend to be too thick for me to apply well, so I put in some thinner and it works great! It's supposed to revive really old polishes as well, so you never have to toss them. Very fairy color. Like it. This looks like such a cute color. I just heard the song, La Vie en Rose, from how i met your mother, it's amazing! The color complements the feeling of the song perfectly! Honestly so in love with pale pink polish! this looks similar to chanel frisson?? how do they compare?? So pretty! I just found you on Youtube, you seem so fun!! Yay! I super love the color! I love this color-it's the perfect neutral pink that goes with any outfit. i've been so obsessed with pink and blush colors. This would definitely look great in my collection lol.